"... as the Governor may deem necessary to defend and for the security of this State ..."
The force consists of citizens or individuals who have begun their naturalization process, who possess a variety of skills, and many members are veterans of other branches of the United States Armed Forces as well as former members of the California Army and Air National Guard. All citizens over the age of 18 who are not felons and possess a high school diploma or GED are eligible to apply for membership, although military veterans and those with special skills which materially contribute to the CSMR's mission are preferred. Members are considered uncompensated State employees,  although when called to Emergency State Active Duty (ESAD), they become compensated employees at the same rate as National Guard members of the same rank. Reimbursement may also be provided in limited circumstances for travel, billeting and meals when directly supporting a National Guard mission. Prior service soldiers are likely to have a smooth transition into the CSMR. If the break in service is long (more than 6 years), the soldier may need an adjustment period while going through IET (see below) to come up to speed with modern Army and National Guard practices. Any MOS qualifications, ribbons, medals, badges, or awards earned in federal or state national guard service transfer directly; this includes "combat patches". Depending on the rank earned and length of time since separation, previously-held rank in those services also transfers. CSMR Regulations require all soldiers to attend the Basic Orientation Course (BOC) which consists of basic military customs and courtesies and a general overview of the CSMR. This is just a basic course spanning a few days at most. In addition to this, any soldier entering the CSMR in the southern region must attend an Initial Entry Training (IET) course through the 223d Training Support Regiment, Southern Detachment. This is a five-month course where soldiers report to a student chain of command that changes every month. They are given weekly homework and accountability tasks to strengthen unit cohesion and train soldiers on how to interact with the chain of command. Every month roles are switched around and new soldiers are assigned as squad leaders while soldiers completing Echo track (final phase) graduate and are released to their gaining units. During this five-month course they report for UTA at the Training Company IEP (Initial Entry Platoon). They are taught customs and courtesies in depth and practice drill and ceremony. This is as physical as it gets; the course is similar to federal boot camp curriculum and training without the physical component. Soldiers are required to maintain Army height and weight standards, but that is done on the soldier's own time. There is no CSMR equivalent to Advanced Individual Training (AIT): This is done on the unit level once the soldier arrives from IET. Other schools are available to soldiers who want to promote in rank. These include NCOA (Noncommissioned Officer's Academy) which has three levels of courses: BLC (Basic Leadership Course: E4-E5), ALC (Advanced Leadership Course: E5-E6), and SLC (Senior Leadership Course: E7 and above). These courses are broken into 4 or 5 live-in phases at Camp San Luis Obispo for 3 days each. On the officer's side is OCS (Officer Candidate School) which is an intense, year-long course meeting 6 times at Camp San Luis Obispo for live-in phases of 4 days each. In both courses, work is done on-site and during the interim. While prior service soldiers retain any MOSq obtained previously, non-prior-service soldiers have no MOS qualification. When Army Knowledge Online (AKO) accounts were available, CSMR soldiers could take courses and become MOSq in select MOS's however at the moment there is no AKO replacement for non-prior soldiers to obtain an MOS. 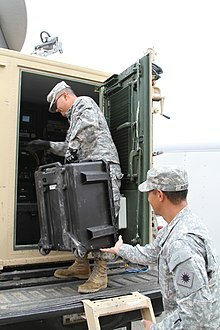 Most of the time the soldier has civilian qualifications that meet or exceed Army standard for a particular MOS and they are used as Subject Matter Experts (SME) to train their national guard counterparts. An example of this is the Small Arms Training Team (SATT) which is responsible for small arms training for the California National Guard. Sgt. Tien Quach, left, the California State Military Reserve, and Sgt. Jason Roldan load equipment into an Incident Commander's Command, Control and Communications Unit (IC4U). California State Military Reserve officer candidates wait to be commissioned as officers. WO1 Joshua Zollo, a firefighter who serves with Alpha Company, 1st Special Troops Battalion, Regional Support Command North, California State Military Reserve, checks under the hood of a Humvee. California State Military Reserve Staff Sgt. Andrew Cater, the acting first sergeant of Alpha Company, Northern Regional Support Command, participates in a crowd control class. CSMR Soldiers board a Los Angeles Port Police dive support ship for a waterfront tour. 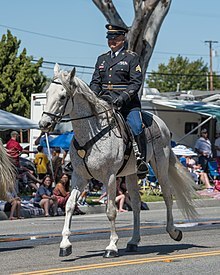 A member of the California State Military Reserve 26th Cavalry Support Regiment marches in the 58th Annual Torrance Armed Forces Day Parade. California State Military Reserve Spc. Juan Ossa, of the Installation Support Command, talks with a truck driver delivering supplies to an emergency supply staging area. The CSMR accomplishes its Homeland Security Mission by providing individual soldiers and airmen as well as rapid response teams to Defense Support of Civil Authorities (DSCA) missions in the preparation, prevention, deterrence, preemption, defense, and mitigation of natural and man-made threats to California. Members of the CSMR are required to serve a minimum of 100 hours annually. Part of that time is spent at Unit Training Assemblies (drills or meetings) which are usually eight to twelve hours on one Saturday each month. Many units require 2-day drills or more depending on their mission. These drills are used for training sessions, activity coordination, and to work with their National Guard counterparts. CSMR soldiers embedded with National Guard units for training purposes will drill the full weekend - or longer - with their National Guard counterparts. The Center for Military History has a Distinctive Unit Insignia which is worn by members. Legal Support Command wears the DUI for JAG. A past large-scale operation of the CSMR was during Operation Fall Blaze in October/November 2007, where over 100 citizen soldiers of the CSMR were integrated with their National Guard counterparts to help firefighters fight the California wildfires. In the 2007 comedy movie Delta Farce, about a group of misfit reservists who think they are in Iraq when they are really in Mexico, the CSMR is alluded to when the characters played by Bill Engvall and Larry the Cable Guy say, "We're just State Military Reserves" "Yeah, SMURFS!". California Maritime Academy—an unrelated maritime academy/university which is operated by the California State University. ^ California Department of Finance (2014), California Governor's Budget 2014-2015 Proposed Budget Detail, 8940 Military Department, Program Descriptions, 55 - State Military Reserve, retrieved 2017-03-28. ^ California Department of Finance (2014), California Governor's Budget 2014-2015 Proposed Budget Detail, 8940 Military Department, 3-Year Expenditures and Positions, retrieved 2017-03-28. ^ "California Military & Veterans Code section 51". Archived from the original on 2012-02-11. Retrieved 2009-10-19. ^ "California Military $ Veterans Code section 120". Archived from the original on 2012-03-30. Retrieved 2010-06-27. ^ "California Government Code section 810.2". Archived from the original on 2010-03-30. Retrieved 2009-08-08. ^ "California Military and Veterans Code section 552-553". Archived from the original on 2012-10-24. Retrieved 2009-08-08. ^ "California Military and Veterans Code section 328". Archived from the original on 2012-03-15. Retrieved 2009-08-08. ^ Mark J. Denger. "History of California State Naval Forces". Retrieved 27 August 2017.